The Secret Letters Of The Monk Who Sold His Ferrari is a fable that, through the remarkable turn of events in Jonathan Landry’s life, describes some of the most powerful insights on achieving lasting happiness. Jonathan Landry is in a difficult phase in his life. He is experiencing the depths of despair, as he struggles to find motivation in his job, and is in a marriage that’s falling apart. During this phase, he happens to meet with his cousin Julian Mantle, the courtroom lawyer whose life was transformed after he renounced his materialistic possessions and received wisdom in the Himalayas. Julian wants Jonathan to retrieve all the secret letters that he had left behind with people that he had come across during his life-changing journey. Jonathan is reluctant to take up this mission, as he would have to leave behind his six-year-old son Adam. But he decides to go, without so much as an inkling of what’s in store for him as he goes about achieving this task. While collecting these secret letters, Jonathan travels to several cities around the world. He visits the Taj Mahal of India, the tango halls of Buenos Aires, the catacombs of Paris, and the brightly lit skyscrapers of Shanghai. As he visits these places, he meets people of different backgrounds, all of whom have their own unique and inspiring stories to tell. He collects the secret letters that Julian had left behind with them, and discovers that the wisdom contained in these letters is timeless, and provides a gateway to unleashing one’s full potential. Gradually, Jonathan begins to shed his thirst for materialism and shifts into a zone, where he begins to discover his true calling in life. He slowly begins to realize the potential that lies dormant within him. The Secret Letters Of The Monk Who Sold His Ferrari was much awaited after the release of its preceding book The Monk Who Sold His Ferrari. This book lives up to all the hype and anticipation surrounding it, and delivers some very powerful messages through the life of Jonathan Landry. This credible collection of insights on discovering one’s true calling and finding real happiness is the main theme portrayed in the book, The Secret Letters Of The Monk Who Sold His Ferrari. Robin Sharma is a leadership coach, motivational speaker, and author. 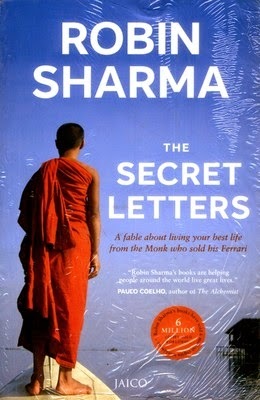 The other books authored by Robin Sharma include The Monk Who Sold His Ferrari, Who Will Cry When You Die: Life Lessons From The Monk Who Sold His Ferrari, Megaliving, The Greatness Guide, and Discover Your Destiny With The Monk Who Sold His Ferrari. Robin Sharma graduated from Dalhousie University School of Law, receiving an L.L.B. degree. After graduation, he began working as a judicial law clerk at the Supreme Court of Nova Scotia and later moved on to the position of staff litigation attorney with the government of Canada. That’s when he began writing books, giving speeches, and making his life and leadership lessons available to as many people as he could. His work as a leadership guru resulted in the founding of the Sharma Leadership International Inc.